The United States Mint released last week a 5-coin proof set of 2019-dated quarters for $15.95. This first dedicated U.S. quarter product of the year was the Mint’s best weekly seller. 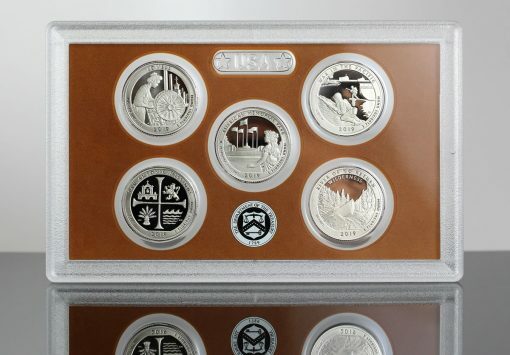 Featuring clad proof quarters with designs honoring national sites in Massachusetts, Northern Mariana Islands, Guam, Texas, and Idaho, the set posted six-day opening sales of 35,936. 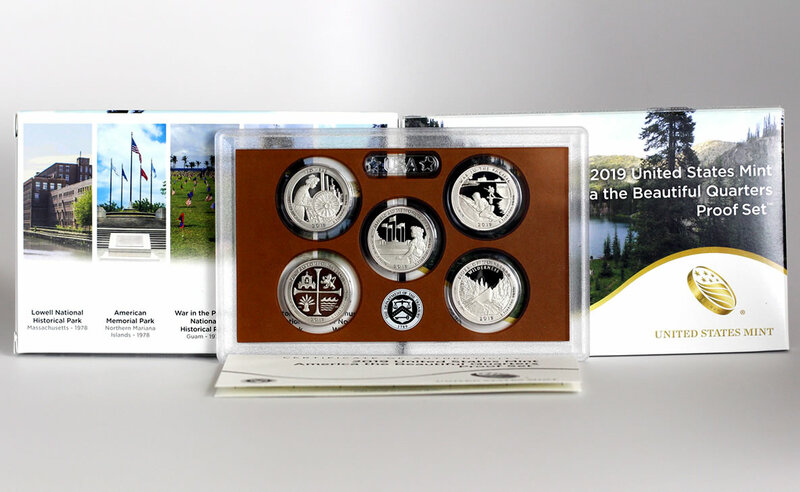 The start is 627 lower than last year’s edition which contains quarters depicting sites in Michigan, Wisconsin, Minnesota, Georgia, and Rhode Island. CoinNews photo of a lens of clad 2019 proof quarters (reverses shown). The coins depict Lowell National Historical Park in Massachusetts, American Memorial Park in Northern Mariana Islands, War in the Pacific National Historical Park in Guam, San Antonio Missions National Historical Park in Texas, and Frank Church River of No Return Wilderness in Idaho. The following table shows early and final sales of sets since the series America the Beautiful quarter dollars kicked off in 2010. *The set from 2016 launched on Jan. 11, 2016 but soon after saw its sales suspended because of a printing error on its packaging. The set relaunched with updated packaging on Feb. 23. Its first reported sales through Feb. 28 totaled 38,733. In its latest report, the U.S. Mint published sales data for 169 numismatic products. Fifty-four products outperformed their prior weekly gains against 17 previously. Not counting the new quarters proof set so as to compare apples-to-apples, 5 products increased by more than 1,000 units against 4 in the previous report. In addition, 16 products saw their sales reduced compared to 20 previously. The losses ranged from 1 to 7 units. Below are tables showing the latest sales for U.S. Mint numismatic products. The sales period covers from Jan. 14 to Jan. 20. Products with an asterisk (*) are no longer available or had no reported sales.